Ah, yes. Summer in Seattle is brilliant. Your fig photos defy words they are so beautiful. Not sure if you are in town for a while, but feel free to give me a shout if you’d like to meet up with any other bloggers is Seattle! It would be fun to chat! what a nice post! enjoy! It’s funny, a lot of Europeans think all the food in America is garbage (or everyone eats only fast food). When I brought a French friend to the farmer’s market in San Francisco, his eyes almost fell out of his head when he saw the quality and variety of what was available. Glad you’re enjoying your trip! Make sure to get French Fries at the Baguette Box, and smoked-salt caramels from Fran’s chocolates…they ain’t haggis, but somehow I don’t think that will be a problem for you. Spectacular fig pictures! Our fig trees are loaded this year, so I’m waiting anxiously to be able to try this recipe out. Melissa, fantastic photos! And a fig/goat cheese clafoutis sounds so wonderful. Im glad you are enjoying some wonderful produce–I remember how dismal it was when I lived in the UK too–everything plastic wrapped or pre-cut.. Im sure its only going to be harder for you when you go back to Scotland. Either way, you seem to be enjoying it to the fullest–this recipe is fab! Oh this is just beautiful! 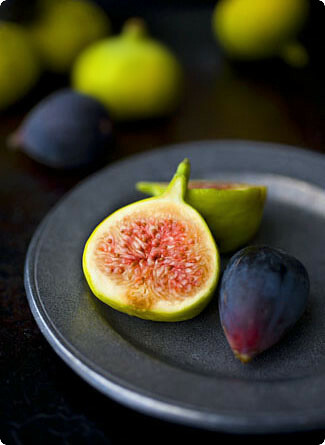 I’m so envious.The first time I tasted a fresh fig-I was just bowled over. Here in PA we cannot compete with the stone fruits and figs and citrus of the Pacific Northwest-though the climate would be right for a lot of the stone fruit, Most of our fruit is imported from CA or Mexico, and not much better than what you’d find in Scotland, unless you know someone with a tree.In the fall we do have a dynamite variety of locally grown apples, though.An astonishing number of Italian -Americans grow fig trees in this inhospitable climate..they dig out one side, topple them over, and cover them with dirt every winter..then dig them out again. An elderly couple on my street has 3 fig trees, covered with lovely fruits.. When they are out working their little mini-farm, and I walk by,I always wave at them and say hello hopefully. I’m trying to figure out how to make friends with them-as I don’t speak Italian, and their English is minimal!I’m sure they think I’m a huge dork. Figs and goat cheese? HEAVEN! Wonderful recipe and mouthwatering photographs! Hi Melissa!fig season just started here in Israel too!and what better way to celebrate maya & shelly mangos, ripe green and purple figs (among other gorgeous produce) than serve these fruits nearly ice-cold, sliced fresh, raw, straight from the fridge.I have a recipe from the new "Al Hashulchan", the new August issue dedicated entirely to summer fruits, which is fig and figling (that german fig liquer, how is it spelled?) granita served inside fresh figs. However, I’d opt for cactus fruit served on phyllo and mascarpone cream. topped with reasberry sauce. How drop-dead gorgeous is that?By the way, this belongs to the mango post all those months ago, but last week I made the frozen yogurt you suggested, and it’s *to die for*!!! !I tried doing the same with frozen raspberries, and added triple or four times as much sugar than I would for mango, just to make it palatable. However my brother who loves sour things, came home from the army and finished the ice cream off. Now I wonder whether I can make red currant sorbet (frozen berries, we don’t have them here fresh). Ooh… You’ve reminded me of how much I wish I was back home in Oregon about now! I’ve been longing for Pacific Northwest food for, well, about seven years now–hopefully I’ll make it back sooner than later, and at the right time of year! I tried my first Clafoutis this past winter, and it was a poor showing. However, I adore figs, and yours looks so good, I’m inspired to try again. Thank you! I’ve fallen in love with clafoutis ever since I made my first one at the start of the summer! I’ve already tried making them with cherries, plums, grapes, and apricots. Your fig one is next on my list! Fresh figs are heaven sent. Lucky for me my neighbor has 6 fig trees in his backyard and generously shares the the fruit! Your blog was one of a few that mede take the plunge and create mine. I love your recipes, stories and pics. Your trip to Jamaica and subsequent posts were awesome. We went to San Francisco for Easter, and WOW did we eat fantastic food! And I’m very picky quality-wise, as I grew up in tropical countries and am partly French, so I’m used to things actually tasting of something. Love your blog BTW, very inspiring and right up my alley. I completely understand how you feel about fresh produce! And it just so happens that figs are my absolute favorite item, the thing that I wait all year for. I did a bunch of fig recipes a few weeks ago on my blog. 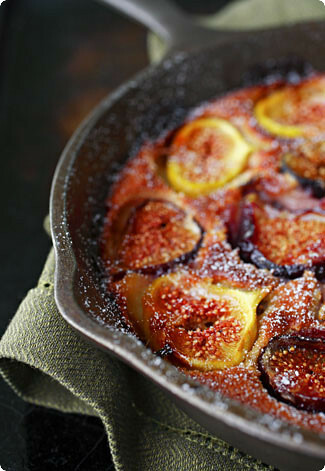 I have not seen a fig clafouti recipe anywhere, and it looks like something I would love. Thanks! ooh. figs. I just made a dish with figs this week. They have such a short growing life and I feel it is my duty to eat as many as possible.I just updated my links on my blog and added you. Oooooh figs! I do love them… And the clafoutis sounds totally sublime. Your description of the Washington market makes me want to board a plane and head over there right now! This recipe sounds scrumptious! I’ve never done much with figs, but this certainly inspires me. And I do greatly envy the produce available in the Seattle area. 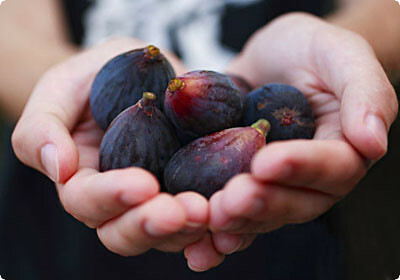 Nonetheless, I will watch for some figs so I can make this recipe! Wow! This looks amazing! I can’t even imagine how wonderful it must taste! My #1 pick for anybody has to be…I’m not sure, but here’s a few:1. Chocolate Couscous. A desert enjoyed by me in Scotland, worked a treat.2. Loganberry Soup. Berry soup? Strangely, it worked.3. Venison in chocolate sauce. A classic nowadays, served in many restaurants. Organic red grapes – Sainsbury’s now have them. Fresh figs…..never mind Scotland, I rarely see them in our Rhode Island farmers markets either! I’m always in awe of the wonderful foods brought home by a friend who visits her family in Seattle frequently. A stash of dried wild mushrooms is one of my prized possessions. Thanks for the clafouti recipe. hello, I was inspired by Pille’s posting on her website and made this yesterday – it was lovely. I used sour cream and a bit less sugar/honey and it was great. Thank you! I like the idea of the cheese to make this classic dessert into a savory dish.